First Lieutenant Timothy E. Fallon, USMC (Retired) is an outstanding example of a young highly motivated Marine officer, who is an inspiration to all who have the pleasure to know him. In November 2010, during the fourth month of Tim’s tour in Helmand Province, Afghanistan, he was conducting a night patrol and was hit by an Improvised Explosive Device (IED). The explosion took the sight of both eyes and caused multiple shrapnel wounds. It also killed the Afghan officer standing in front of him. The next thing Tim knew he was in Walter Reed Army Medical Center, Washington, DC undergoing treatment to attempt to restore some eyesight and heal his other wounds. By Early December he had experienced three operations on his eyes which managed to save them from total destruction. To this day, he is legally blind and can only see vague shapes and shadows. Tim came to the attention of the Wounded Warrior Mentor Program and I was asked to be his mentor in early 2011. In May he traveled with a small group of other blinded veterans to England for a week long program meeting British veterans who also had been blinded. This venture was sponsored by the Washington, DC based Blinded Veterans Association (BVA). On the 23rd of June Tim was promoted from 2nd to 1st lieutenant in front of the flag pole at Walter Reed with his parents, several family members, about 20 other wounded Marines, and his fiancé Sarah in attendance. He had expressed interest in continuing his education through graduate school and perhaps even a law degree, with some aspirations of eventually joining the State Department. Ms. Heather Bernard, Mentor Program Education Advisor was instrumental in assisting Tim with information, applications, and even a ride to some classes. Part of Tim’s adjustment to a world of darkness was to go to the VA Medical Center in Hines, Illinois for an in-residence course teaching fundamentals of everyday living and coping. Sarah, who worked for Ernst and Young in Philadelphia was able to transfer to their office in the Washington area, thereby becoming Tim’s primary care provider. On September 2, 2011 Tim and Sarah were married and then honeymooned in Saint Thomas in the Virgin Islands. Many individuals have offered help and encouragement to Tim including the Sentinels of Freedom, a California philanthropic group which provides moral and material support to a number of wounded servicemen and women. He also worked closely with the Marine chain of command and Ms. Theresa Blackledge, Marine Transition Coordinator. 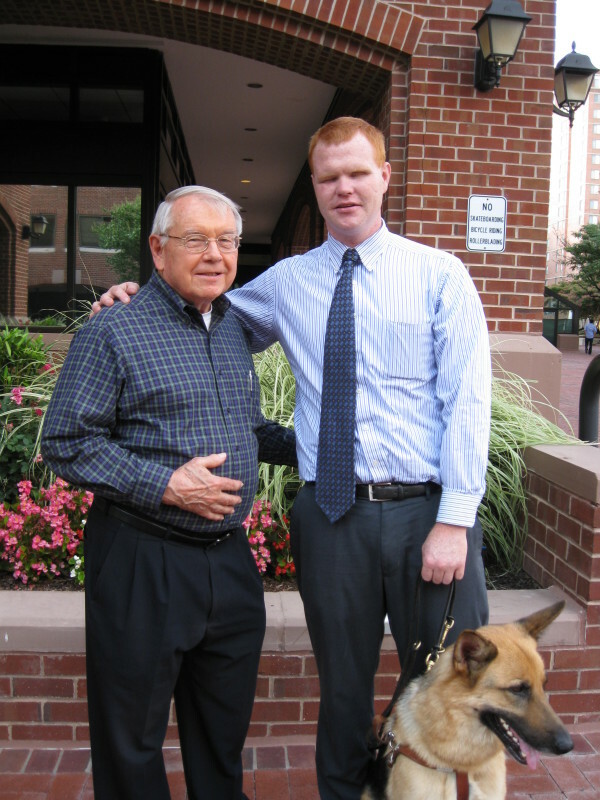 I invited Tim to visit my office, National Industries for the Blind, to allow him to speak and interact with several blind or severely visually impaired employees who were helpful by discussing with him that blindness may be a setback, especially from traumatic injury, but need not be a determent to a happy, productive life. In March 2012 Tim went to the Seeing Eye Guide Dog School in New Jersey to learn to work with a guide dog; he returned with a beautiful German Shepherd named Orson, and they work wonderfully well together. Through the Department of Defense Operation Warfighter program Tim was able to enter an internship in the Counter-Terrorism Center under the Director of National Intelligence with the anticipation of being able to transition into a full time GS position after release from active duty. He and Sarah purchased a home in Rockville, MD relatively close to the Metro Rail System. Even though they have an automobile, which Sarah drives, Tim takes the Metro to work and to several of his graduate courses. They have decided the Washington metropolitan area is to be their home, at least for the foreseeable future. On January 18, 2013 Tim was medically retired from the Marine Corps at an inspirational ceremony held in the Marine Corps Museum at Quantico Marine Base, Virginia. Not only were Tim’s family and many friends there, including Marines who had served with him, but his brother, a Marine Captain conducted the retirement ceremony. Following a short vacation Tim Fallon has started a new leg of his career with the Department of Defense in Washington, DC, and is continuing his goal of attaining a masters degree from Georgetown University. Tim, with the love and support of Sarah undoubtedly will have a long, successful, and enjoyable future. I feel honored the Wounded Warrior Mentor Program has given me the opportunity to know and work with such a fantastic couple.